Despite the campaign of confusion and fear run by our opponents and the misinformation provided by the Federal Council and the Swiss National Bank, an estimated 26% voted for the Sovereign Money Initiative. This is a respectable outcome and shows that many Swiss people have realised that the creation of money by private commercial banks leads to numerous problems. The thousands of volunteers deserve recognition for their commitment, which has led to this respectable result. The people bringing the initiative naturally acknowledge the result of the referendum. However, from the viewpoint of the MoMo (the association behind the initiative), the referendum is only the starting point for a fundamental discussion about our monetary system. The two SRG polls taken before the referendum clearly showed that the majority of people do not want private commercial banks to create our Swiss francs, but rather, the Swiss National Bank should have this responsibility. Despite this being the goal of the Sovereign Money Initiative, the initiative did not win a majority. Due to limited resources and the complexity of the matter, the committee of the Sovereign Money Initiative has obviously not been able to provide the public with sufficient information. Additionally the fear campaign run by banking lobbyists contributed to the final result. The problems in the banking system have not been solved, and a large proportion of the population is of the same opinion. Action is still urgently needed, because the next financial crisis will happen with certainty. Politicians must now take concrete measures to guarantee that both our money and the payment transaction system remain completely secure in a crisis. It is not acceptable that private commercial banks continue to jeopardise our prosperity by creating money out of nothing. In addition, technological developments such as crypto currencies will pose major challenges to the Swiss monetary system and the global economies. MoMo, the association bringing the Sovereign Money Initiative, is well established and has developed a strong network in recent years. MoMo’s constitution states: "The association is committed to putting the financial economy at the service of the real economy and the monetary system at the service of the people". The high level of support shown in this referendum strengthens MoMo’s position, and it will continue to influence the political debate with these aims. Many of those voting “No” did not vote on the Sovereign Money Initiative, but on the distorted picture of it that was conveyed to them by the authorities and the banking lobby. The result of the referendum cannot therefore be interpreted as approval of the privatisation of Switzerland's money creation. Furthermore, the legal complaint brought by Michael Derrer regarding misleading communication by the authorities is still pending at the Federal Supreme Court. The people bringing the Sovereign Money Initiative hope that the Federal Council and authorities will learn the lessons from this case and that, in the future, they will avoid issuing misleading propaganda. Further reports about Sovereign Money and related ideas can be found on our website here. These are mostly international and do not refer to the Swiss Sovereign Money Initiative in particular. (Do not be put off by some of the summary texts being in German, the links are to texts in English). 03/01/2016: Swiss Sovereign Money Inititive Newsletter: a Christmas Present! 27/12/2015: Switzerland: Poised for a revolution? 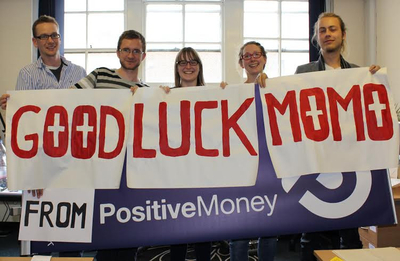 29/05/2014: Exciting News from Switzerland: An Initiative for a referendum on monetary reform is starting! Switzerland is politically unique in this regard as the Swiss Constitution provides a political instrument known as the Volksinitiative (Peoples’ Initiative) which enables Swiss citizens to launch an initiative aimed at changing specific provisions within the Swiss Constitution. To do so requires first of all the collection within an 18 month period of 100’000 valid signatures in support of the initiative. Should this hurdle be surmounted, the initiative would then be put to a national vote. In a nut shell, the proposal extends the Swiss Federation’s existing exclusive right to create coins and notes, to also include deposits. With the full power of new money creation exclusively in the hands of the Swiss National Bank, the commercial banks would no longer have the power to create money through lending. The Swiss National Bank’s primary role becomes the management of the money supply relative to the productive economy, while the decision concerning how new money is introduced debt free into the economy would reside with the government. As is evident from the foregoing, the MoMo monetary reform initiative is essentially based on the monetary reform advocated by PositiveMoney. For those interested in following the developments of the campaign, or who would like to understand the detailed provisions, including those relating to the transition period, please refer to the campaign website. The website is in German, French, and Italian, so language might present a limitation for many of you. Nevertheless, we do encourage you to visit the website and if you have specific questions, to leave a message in English. Someone from the team who speaks English will get back to you. The biggest challenge for the team at this stage of the campaign is to find the needed help and financing for signature collection. The minimum amount of funding required for a successful campaign is estimated to be 400’000 CHF or just over 270’000 GBP. Although, this is a non-UK initaitive, should the MoMo team succeed in putting such a fundamental reform proposal to a national vote, this would be a momentous achievement for the monetary reform movement in Europe and across the globe. All eyes would be fixed on Switzerland, because success for this small but significant player in the financial arena would inevitably have a ripple effect in other countries.